Retinoblastoma (RB) is completely curable if detected and treated early. Incidence of RB has wide geographical variation so is the survival and prognosis. There has been a paradigm shift in the management protocol of RB, which has successfully evolved through the past decades. It would be still prudent to mention with affirmation that the primary goal in managing RB is to save child's life, saving eye and vision being secondary and tertiary goals, respectively. The right way to start the review would be to quote the recent editorial of Kivela “Alive with good vision: The ultimate goal in managing RB.” However, the author also revisits the different hurdles to surmount in attaining these goals, which also varies globally. The estimated number of new cases of RB diagnosed globally is 7202–8102 each year. Outcome is favorable in countries such as the USA, Europe, Australia, New Zealand, and Japan, where mortality is <5%. In these countries, tremendous efforts are being taken toward preserving vision with innovative treatments and also reducing treatment-related complications. In contrast, countries in Asia, Africa, and South America where the reported mortality rate is as high as 20%–60%, it is primarily a fight to save life. It is estimated that 3001–3376 children die annually due to this curable eye cancer. Dimaras et al. in their editorial questioned about this global RB survival disparity expressing the two different outlook of the same disease in a developed and underdeveloped country. Nevertheless, it is agreed by various authors that the lack of awareness about this disease and its symptoms hinders early detection and referral. In addition, other major factors include lack of medical expertise and nonavailability of affordable treatment protocol and suboptimal surgical and pathological management.,,, Although the management of RB has evolved over the years, we still lack a uniform global outreach to curb this dreadful childhood intraocular malignancy. The management of RB is an art in itself, which encompasses saving life and retaining eye and vision for a productive daily life, taking into consideration all socioeconomic barriers., With this in view, we have taken an effort to highlight the key factors in the diagnosis, classification, and management of RB. No child should die of RB; no child should lose the eye, but stay alive and see the world. The genetics of RB has been accepted as the prototype of numerous cancers in the human race. Two-step biallelic inactivation of human RB susceptibility gene, RB1 on chromosome 13q14 that codes for RB protein, represents the key event in the pathogenesis of RB. According to Knudson's two-hit hypothesis, the development of RB requires mutation of both copies of RB1 gene and manifests as two forms, sporadic nonhereditary (somatic) and hereditary (germline). In the nonhereditary form (60%), the mutation occurs at the cellular level during the development of retina, leading to unilateral sporadic form often presenting late after the 1st year of life. In hereditary RB (40%), one allele is mutated in the germline and the other at the cellular level. The heritable form of RB often has an early onset presenting as bilateral, multiple tumors and is transmitted to successive generations in an autosomal dominant fashion., Approximately 5%–10% of patients have one or more affected member in the family. It also increases the risk of development of secondary nonocular cancers, namely osteosarcoma in the long bones of arms and legs and soft tissue sarcomas of head and skull. Furthermore, patients undergoing radiotherapy before 1 year of age are at higher risk of developing the tumor of the irradiated field. More profound and lethal is the occurrence of primitive neuroectodermal tumors in the pineal gland – so-called trilateral RB., The prognosis is invariably poor, and children succumb to the disease. It is essential to identify the genetic mutation in RB for the modification of management and identify the future generations at risk at an early stage. Genetic counseling is as important as treating the disease in a broader perspective. Unfortunately, there is lack of awareness among the parents and family regarding the development of RB in the successive generations. The role of the treating ocular oncologist and geneticist in educating the family members is extremely valuable. The recent International RB Staging System by Chantada et al. is widely accepted and incorporates intraocular and extraocular disease under five distinct stages based on collective information on clinical evaluation, ocular imaging, histopathology, and systemic survey [Table 2]. The staging system predicts life salvage and long-term survival. As in any other cancers, the American Joint Committee on Cancer-T-tumor, N-node, M-metastasis classification was applied to RB and the current 8th edition has included H-hereditary, to emerge as TNMH classification, making RB, only cancer where heredity is included. This indicates the role of genetic predisposition and its implications in clinical diagnosis, classification, management, and screening as well. Diagnostics in Retinoblastoma: Is There a Leap? The most characteristic clinical feature of RB is yellowish white vascular retinal mass with associated calcification and subretinal fluid and frequent subretinal and vitreous seeds. From time immemorial, the most common diagnostic tool in conforming the diagnosis is ultrasonography showing characteristic intraocular mass with calcification as indicated by high internal reflectivity. This is relevant till date, and other modalities such as fluorescein angiography, autofluorescence (AF), computed tomography (CT), magnetic resonance imaging (MRI), and optical coherence tomography (OCT) provide additional information. It is true that the management of RB has evolved since the last four decades. Untreated RB is uniformly fatal. The primary goal still remains to save the child's life. The secondary and tertiary goals are eye salvage and vision salvage, respectively. Enucleation was considered the treatment of choice of RB a century ago and gradually replaced by more conservative external beam radiation with well-recognized complications, until 1990. Since then, the management of RB has undergone a paradigm shift owing to better alternatives to save life, eye, and vision. However, the current trends are challenging and customized. The introduction of systemic intravenous chemotherapy was a breakthrough and to a larger extent has helped avoiding enucleation in bilateral as well as unilateral RB. Chemotherapy alone is not curable, without additional cryotherapy and transpupillary thermotherapy (TTT) or laser. The more localized and targeted treatment involves plaque brachytherapy; the most recent is intra-arterial and intravitreal chemotherapy.,,,, In short, the management is highly individualized and requires a multidisciplinary team comprising trained ocular oncologist, oncopathologist, pediatric oncologist, radiation oncologist, interventional radiologist, neurosurgeon, and geneticist. Multimodal customized treatment has improved the outcome. The available modalities are briefly outlined below. Regardless of the progress and advancement in the treatment strategies of RB, systemic chemotherapy is the favored modality in developing countries with regard to availability and affordability. The introduction of intravenous chemotherapy “CRD” changed the outlook toward dreadful childhood cancer, essentially increasing the survival rate and preserving eye and vision. CRD reduces the size of the tumor and makes it amenable for local treatment. Intravenous chemotherapy (IVC) alone is not curative but always combined with intensive local therapy [Figure 1]. Apart from chemoreducing the tumor, the major advantages of systemic chemotherapy lies in preventing the more devastating systemic micrometastasis, pineoblastoma, and second malignant neoplasm. The major cause of death in RB is systemic metastasis. It has been reported that 18%–50% of eyes enucleated for RB carries histopathological high-risk factors for systemic metastasis, which include eyes with tumor invading the uvea, optic nerve, or combination of both., Honavar et al. in their landmark study observed occurrence of metastasis in 24% of patients not receiving systemic chemotherapy when compared to 4% of those who received IVC following enucleation. In a recent study by Kaliki et al., this beneficial effect of IVC was further reconfirmed with 100% survival. Shields et al. over the years have noticed the reduced incidence of pineoblastoma, attributed to the IVC administered. Pineoblastoma in the past is reported in 8%–10% of children with germline mutation, whereas in a case series of 100 patients with germline mutation undergoing chemotherapy, there was none. This protective mechanism with IVC is considered relevant by the authors through their decades of experience. IAC is a novel technique designed to combat RB locally and directly. Is IAC here to stay? In the current scenario, the speculation is high and the excitement regarding this technique of delivering chemotherapeutic agent directly to the tumor via ophthalmic artery is tremendous. Unlike systemic chemotherapy with excellent tumor control and limited systemic side effects, IAC is technologically challenging, requiring a highly skilled interventional radiologist or neurosurgeon, making it unavailable universally, especially in developing countries. The introduction of this technique dates back to 1955, when Reese et al. treated RB with direct catheterization and infusion of triethylenemelamine into the internal carotid artery. Kaneko and Yamane developed a targeted approach of selective ophthalmic artery infusion (SOAI) balloon occlusion technique, using melphalan, in an effort to reduce complications. However, authors failed to provide adequate data on tumor control and ocular complications. Abramson and Gobin further modified the technique into super SOAI by directly entering the proximal branch of ophthalmic artery. The drugs infused were topotecan, carboplatin, and melphalan, which are relevant till date and time tested for this technique. Shields et al. found primary therapy of IAC successful in 100% of group C eyes, in 100% of group D eyes, and 33% of group E eyes. It is emerging as a technique of choice in unilateral advanced RB. This may not be true in all cases, and IAC fails to prevent systemic metastasis. Gobin et al. in their series had reported two cases with systemic metastasis following IAC. Peterson et al. also reported 75% globe salvage in-group D eyes with no systemic complications, except transient neutropenia. Shields et al. found the “minimal exposure” IAC using only one or two doses of IAC for selected cases of group C and less advanced group D eyes. Using IAC in advanced group E eyes that may otherwise have clinically undetectable choroidal invasion, optic nerve invasion, and scleral invasion carries high risk of systemic metastasis and orbital recurrence in the absence of systemic chemotherapy. Hence, the use of IAC should be limited to less advanced disease. One should not sacrifice life, in the urge of retaining the globe with poor visual potential. Major complications of IAC is related to vascular toxicity of ophthalmic artery and retinal and choroidal vessels. Wilson et al. substantiated these deleterious side effects potentially vision-threatening in rhesus macaque monkey. Intra-arterial injection of melphalan caused retinal arterial narrowing, choroidal blanching, and retinal edema in all cases at the time of injection. Moreover, melphalan could be endothelial toxic causing endothelial changes and fibrosis. Muen et al. evaluated the ocular side effects in 15 eyes receiving IAC melphalan at a mean follow-up of 8.7 months. Despite 80% tumor control, local side effects included significant retinal pigment epithelial changes (47%), third cranial nerve palsy (40%), vitreous hemorrhage (27%), orbital edema (20%), and permanent retinal detachment (7%). Shields et al. and Munier et al. observed similar findings in their series., Eagle et al. histopathologically confirmed these findings in the eight eyes enucleated after IAC and observed choroidal ischemia (50%), intravascular foreign body material (62%), and thrombosed vessels (62%). Bianciotto et al. reported the results of FFA finding in 24 eyes after 55 IAC procedures and found sectoral and diffuse choroidal nonperfusion as the most common vascular abnormality. Our team has been cautious in patient selection, and based on these complications, the technique has been modified with excellent results [Figure 3]. We agree with the editorial comment of Levin et al. ; the stage is set to evaluate IAC in RB. The long-term visual outcome and systemic complications are still unknown. The outcome of advanced eyes/group D remains a challenge, with high rate of recurrence and systemic chemotherapy failure, often requiring EBRT. The globe salvage with EBRT is not more than 20%–30%, offering suboptimal control of the disease with associated complications, especially in children with the only seeing eye in heritable bilateral RB. The direct delivery of chemotherapeutic agents into the vitreous cavity was assumed to provide adequate tumor control. Intravitreal chemotherapy has proven to be useful in treating eyes with persistent and/or recurrent refractory vitreous seeds. The history dates back to early 1960 when Ericson et al. used thiotepa intravitreally with the aim of achieving highest concentration of drugs in the vitreous cavity. Six eyes were treated and showed massive recurrence requiring enucleation. Sooner, it was not favored by many due to the presumed risk of tumor seeding through the needle track. However, it was reexplored by Seregard in three eyes with advanced RB; none of the patients responded to intravitreal thiotepa, ultimately requiring enucleation. There remained a continuous effort to explore the effective tumoricidal agent for intravitreal injection. Soon, Inomata and Kaneko found melphalan to be the most effective and relatively less toxic agent intravitreally as evidenced by thein vitro experiment in the rabbit model by the authors. The estimated nontoxic dosage was 5.9 μg in the rabbit model, and on extrapolation to human eyes, the safest dosage of intravitreal melphalan was considered to be 20–30 μg depending on the patients' age and size of the globe. Kaneko et al. treated 41 eyes with 8 μg of melphalan. Although enough details are not available to validate the study, at 50 months of follow-up, the authors claimed an eye preservation rate of 51.3%. Munier et al. introduced the safety-enhanced technique of intravitreal chemotherapy and published their initial series of 23 eyes, which failed previous therapy, which underwent 20–30 μg intravitreal injection of melphalan. Patients received a total of 122 injections, 7–10 days apart. The authors were cautious to cryo the site of injection to prevent extraocular tumor spread and could achieve globe preservation rate of 87% (20/23) at 22 months of follow-up without extraocular tumor seeding. The only complication observed was salt-and-pepper retinopathy noticed in 43% of eyes due to localized toxicity at the site of injection. The initial results of 11 eyes with intravitreal melphalan showed 100% regression without recurrence by Shields et al. Ghassemi and Shields observed that eyes receiving 8–10 μg showed suboptimal response and higher doses of >50 μg led to phthisis bulbi. Melphalan is known to cause ocular toxicity. In our experience, it is found to be enhanced in pigmented eyes as in Asians although further evaluation with prospective phase II trial is required to validate it. Topotecan as an intravitreal chemotherapeutic agent is being explored considering the favorable and reduced toxicity profile. In our experience, the outcome was encouraging. In combination with systemic chemotherapy or IAC, it has improved the eye salvage rate [Figure 4]. Periocular subtenon chemotherapy has limited indications in the current era of direct intravitreal delivery. Focal application of radioactive device enables to deliver radiation locally reducing ocular side effects and targeted treatment. RB is a chemosensitive tumor. Plaque brachytherapy is the method of placing a radioactive plaque on the sclera corresponding to the base of the tumor and rendering trans-scleral irradiation to the tumor. Most commonly used radioactive materials are iodine-125 (t1/2–59.4 days) and ruthenium-106 (t1/2–1 year). The main indication is recurrent or residual tumor, following CRD and focal treatment. Shields et al. analyzed the outcome of plaque brachytherapy as a primary treatment (29%) and secondary treatment (79%). The average tumor size was 8 mm in basal diameter and 4 mm in thickness. The dosage delivered to the tumor apex ranges from 3500 to 4000 cGy and mandates precise tumor localization and measurement of tumor dimensions for optimal treatment. The authors have reported a tumor control of 95% at 5 years with I-125 plaque brachytherapy. The main predictive factor for failure is advanced tumor with subretinal seeds and vitreous seeds. Nevertheless, it is effective in treating focal well-contained subretinal seeds when the involved area is too extensive for focal treatments. The common complications anticipated are radiation retinopathy and maculopathy with unfavorable visual outcome. Long-term best-corrected visual acuity (BCVA) in 103 eyes treated with brachytherapy at 40 months of follow-up was evaluated and found that 60% had good BCVA (20/20–20/400) and was poor in 28% Counting finger to no light perception (CF-NLP). Globe salvage failed in 11% of eyes. Until late1990, EBRT was the preferred form of globe-salvaging management in RB. With the advent of better treatment options, it is rarely indicated in the treatment of RB. However, it is considered as a part of the multimodal treatment protocol in advanced extraocular orbital RB and rarely in eyes with failed primary therapy. Attempts were made to reduce the local damage and improve targeted treatment and led to better modalities such as intensity-modulated radiotherapy, image-guided radiotherapy, stereotactic radiotherapy, and proton beam radiotherapy. The standard dose delivered ranged from 3500 to 4500 cGy, daily fractionated (14–20 fractions) doses over 4 weeks or alternate day EBRT. The once popular modality is less preferred owing to the short-term and long-term adverse effects. The most common adverse effects include dry eye, radiation cataract, neovascular glaucoma, radiation retinopathy, and orbital and midfacial growth retardation. The most dreaded complication is the risk of development of second malignant neoplasm, especially in patients with hereditary forms of RB and mostly radiation dose dependent. The risk is as high as 50% at 53 years of age in this group when compared to 6% in patients with nonheritable tumor. Abramson estimated that patients undergoing EBRT at <12 months of age are at greater risk when compared to >12 months of age. The most common complication was radiation-induced cataract in 28% eyes, with no evidence of development of second malignancy with a median radiation dose of 4200cGy at the end of 10 years. There prevail techniques applied directly to the intraocular tumor either as a primary modality, but most often as adjunctive to CRD and consolidation. Cryotherapy is effective in small equatorial and peripheral retinal tumors measuring up to 2 mm in thickness and 4 mm basal diameter. The cryoprobe is applied trans-sclerally, rendering repeated multiple freeze-thaw cycles until complete tumor regression. Cryotherapy applied before chemotherapy has synergistic effect by increasing the delivery of chemotherapeutic agents across the blood–retina barrier. Laser treatments play a major role in tumor control. The use of diode laser in Transpupillary thermotherapy (TTT) is the most common and widely used technique with minimal complications. The focused heat generated by the infrared radiation is applied over the tumor at a subphotocoagulation level to induce tumor necrosis-sparing damage to the retinal vessels. The laser is applied with a 1300-μ spot until the tumor turns subtle gray and provides satisfactory control for small tumors with <2 mm in thickness. Multiple sessions are administered until the tumor is reduced to a flat chorioretinal scar. Major advantage is its adjunctive role during CRD, where the heat dissipated amplifies the cytotoxic effect of systemic carboplatin – the term known as chemothermotherapy. The known complications are focal iris atrophy, peripheral lens opacification, retinal traction, retinal vascular obstruction, and transient localized serous detachment. Despite the several advancements in the management of RB as mentioned and discussed, enucleation is still considered the primary treatment of advanced RB and is life-saving. Recently, the frequency of enucleation has steadily decreased for better conservative modalities. It is not uncommon in the developing countries where > 50% of children present with advanced RB requiring enucleation. The known indications of enucleation are eyes belonging to group E; tumor occupying more than two-thirds of globe, anterior chamber tumor seeding, neovascular glaucoma and hyphema, necrotic tumor with secondary orbital inflammation, associated vitreous hemorrhage, and hazy media precluding the visualization of the tumor. The technique requires modification as to reduce the risks of globe perforation and orbital tumor seeding. The preferred method is meticulous dissection, minimal manipulation enucleation with long optic nerve stump, ideally >15 mm [Figure 5]. Placement of orbital implant is advised in all children undergoing enucleation, primarily to stimulate orbital growth and thereby improving cosmesis, and furthermore, socket may be fitted with custom-made prosthesis [Figure 6]. Figure 5: An enucleated eyeball with long optic nerve stump measured as 20 mm (asterisks) with caliper. Area with suspected thinning of sclera (black arrow) and dilated emissary vein (black dotted arrow) is marked for careful histopathological sectioning and evaluation. Enucleation is not the end of RB management and does not imply that the life is saved. 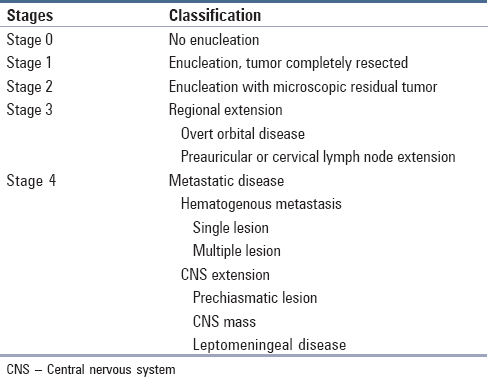 The eyes undergoing enucleation may carry both clinical and histopathological high risks for systemic metastasis as enumerated in [Table 4]. Kaliki et al. defined high-risk RB in postenucleated eyes with invasion of retrolaminar optic nerve invasion, choroidal invasion of 3 mm or greater, anterior segment invasion, and any degree of optic nerve and choroidal invasion. The incidence of high-risk features (HRFs) is found to be geographically variable. According to Eagle et al., 18.5% of eyes had features suggestive of high risk for metastasis. In contrast, Gupta et al. reported 54% of eyes carried HRF. The subsequent steps are crucial in deciding the life-saving measures and future challenges. Adjuvant chemotherapy remains mandatory and remarkably improves survival preventing systemic metastasis. There are several chemotherapy protocols followed in various centers worldwide. Honavar et al. found that the risk of metastasis reduced to 4% after adjuvant chemotherapy compared to 24% not receiving treatment. Outcome in Retinoblastoma: Where Have We Reached? Systemic chemotherapy and recent targeted therapies have proven successful in salvaging >98% of group A, B, and C eyes. The challenge remains in group D and E eyes with advanced intraocular disease. The globe salvage was <50% in advanced group D and E eyes with systemic chemotherapy; however, combination of escalated doses of CRD regimen with local delivery of subtenon chemotherapy could still salvage 83% of eyes. Manjandavida et al. showed 76% globe salvage in group D RB with visual acuity ≥20/200 in 95% eyes, following CRD and periocular carboplatin injection. The group E eyes pose a challenge to conservative management, and most authors prefer enucleation as primary management, which cannot be argued upon and is still relevant. In the former study, eye salvage in group E eyes with CRD in combination with periocular carboplatin and low-dose radiotherapy was 58% and visual acuity maintained at ≥20/200 in 91% eyes. Shields et al. in their analysis of their 5-year experience with IAC concluded that primary therapy with IAC achieved globe salvage for group B (100%), group C (100%), group D (94%), and group E (36%). Abramson et al. reported that IAC is effective for curing group D RB and globe salvage rate was 85% at 110 months, even in eyes that previously failed other treatments. The study by Demirci et al. suggests that the goal of vision salvage is reasonable and not impossible. This is true in developed countries where the disease is detected early; unlike developing countries, it has been a struggle to save life compromising the eye in advanced RB. However, there are unpublished data from countries like India where the eye salvage is as high as 85%. According to Demirci et al., the mean 5-year visual outcome was 20/20–20/40 in 50% of eyes and 67% had vision ≥20/200. The major detriment to poor vision in RB is the foveal location of the tumor, and various authors have reported the complications of the local consolidation therapy, to a lesser extent. Kim et al. confirmed this where 80% of eyes with extrafoveal involvement retained a vision of ≥20/40. Recent report by Narang et al. observed favorable long-term visual outcome after CRD, attaining an ambulatory vision of ≥20/200 in 71% eyes and ≥20/40 in 37% eyes. The authors also concluded that foveolar involvement and greater number of tumors were the predictors of long-term visual outcome of 20/40 or better. The visual outcome after IAC is not well evaluated. Munier et al. found 31% (4/13) of patients receiving IAC retained vision of 20/50 or better. However, their study did not state the proportion of patients with foveal involvement before treatment. Tsimpida et al. examined the visual outcome in patients with refractory RB who had previously undergone systemic chemotherapy, with or without local treatment, and were subsequently treated with IAC. Five of 12 eyes (42%) demonstrated severe visual loss at last follow-up due to local toxicity and side effects of IAC. The major cause of death in RB is systemic metastasis, secondary malignancies, and pineoblastoma. Life salvage in intraocular RB is reported to be >98% if detected early and treated with appropriate protocols. It is important to identify the clinical and histopathological HRFs for systemic metastasis so at to choose the management accordingly. In the presence of the red flags, systemic evaluation with bone marrow biopsy and cerebrospinal fluid cytology is mandated for staging. Meticulous clinical examination helps identify the clinical risk factors of systemic metastasis that includes secondary glaucoma, aseptic orbital cellulitis, proptosis, and phthisis bulbi. Postenucleation adjuvant chemotherapy in high-risk scenarios improves life salvage. A recent study by Kaliki et al. confirmed this finding with 100% survival following adjuvant chemotherapy protocol using triple-drug regimen (vincristine, etoposide, and carboplatin). Orbital RB with the tumor spreading outside the confines of the globe has poor prognosis with reported mortality as high as 100% with conventional treatment. With the introduction of sequential intensive multimodal therapy including high-dose chemotherapy, enucleation and stereotactic radiotherapy it has a reported survival of 90%. In the presence of central nervous system metastasis, the prognosis is poor despite the advances that we have made in RB. However, attempts have been made to tackle the disease with high-dose systemic chemotherapy, radioimmunotherapy, and intrathecal chemotherapy with limited benefits, but palliative. RB is completely curable if treated early and life-saving if adequate measures are taken in combating it at every step. The choice of chemotherapeutic agents and route of administration continue to evolve. However, the management varies from patient to patient, depending on the stage of the disease, availability of technical skills, and finally choosing the optimal cost-effective therapeutic modalities. Moreover, the art of management lies in early detection, selection of appropriate management strategy, and long-term follow-up to assess recurrence and treatment-related complications. Above all, it is the family whom you treat, not the patient alone. Kivelä T. Alive with good vision: The ultimate goal in managing retinoblastoma. Clin Exp Ophthalmol 2012;40:655-6. Kivelä T. The epidemiological challenge of the most frequent eye cancer: Retinoblastoma, an issue of birth and death. Br J Ophthalmol 2009;93:1129-31. Dimaras H, Dimba EA, Gallie BL. Challenging the global retinoblastoma survival disparity through a collaborative research effort. Br J Ophthalmol 2010;94:1415-6. Ramasubramanian A, Shields CL, editors. Epidemiology and magnitude of the problem. In: Retinoblastoma. New Delhi, India: Jaypee Brothers Medical Publishers; 2012. p. 10-5. Rodriguez-Galindo C, Wilson MW, Chantada G, Fu L, Qaddoumi I, Antoneli C, et al. Retinoblastoma: One world, one vision. Pediatrics 2008;122:e763-70. Chantada GL, Qaddoumi I, Canturk S, Khetan V, Ma Z, Kimani K, et al. Strategies to manage retinoblastoma in developing countries. Pediatr Blood Cancer 2011;56:341-8. Chantada G, Fandiño A, Manzitti J, Urrutia L, Schvartzman E. Late diagnosis of retinoblastoma in a developing country. Arch Dis Child 1999;80:171-4. Shields CL, Fulco EM, Arias JD, Alarcon C, Pellegrini M, Rishi P, et al. Retinoblastoma frontiers with intravenous, intra-arterial, periocular, and intravitreal chemotherapy. Eye (Lond) 2013;27:253-64. Friend SH, Bernards R, Rogelj S, Weinberg RA, Rapaport JM, Albert DM, et al. Ahuman DNA segment with properties of the gene that predisposes to retinoblastoma and osteosarcoma. Nature 1986;323:643-6. Knudson AG Jr. Mutation and cancer: Statistical study of retinoblastoma. Proc Natl Acad Sci U S A 1971;68:820-3. Ramasubramanian A, Shields CL, editors. Genetics of retinoblastoma: Molecular and clinical aspects. In: Retinoblastoma. New Delhi, India: Jaypee Brothers Medical Publishers; 2012. p. 24-33. Meadows AT, Leahey AM. More about second cancers after retinoblastoma. J Natl Cancer Inst 2008;100:1743-5. Parsam VL, Kannabiran C, Honavar S, Vemuganti GK, Ali MJ. A comprehensive, sensitive and economical approach for the detection of mutations in the RB1 gene in retinoblastoma. J Genet 2009;88:517-27. Xu K, Rosenwaks Z, Beaverson K, Cholst I, Veeck L, Abramson DH, et al. Preimplantation genetic diagnosis for retinoblastoma: The first reported liveborn. Am J Ophthalmol 2004;137:18-23. Gallie BL, Hei YJ, Dunn JM. Retinoblastoma treatment in premature infants diagnosed prenatally by the ultrasound and molecular diagnosis. Am J Hum Genet 1995;Suppl 65:A62. Murphree AL, Triche TJ. An epigenomic mechanism in retinoblastoma: The end of the story? Genome Med 2012;4:15. Livide G, Epistolato MC, Amenduni M, Disciglio V, Marozza A, Mencarelli MA, et al. Epigenetic and copy number variation analysis in retinoblastoma by MS-MLPA. Pathol Oncol Res 2012;18:703-12. Reese AB, Ellsworth RM. The evaluation and current concept of retinoblastoma therapy. Trans Am Acad Ophthalmol Otolaryngol 1963;67:164-72. Hopping W. The new Essen prognosis classification for conservative sight- saving treatment of retinoblastoma. In: Lommatzsch PK, Blodi FC, editors. Intraocular Tumors: International Symposium under the Auspices of the European Ophthalmoloigcal Society. Berlin, Germany: Springer-Verlag; 1983. p. 497-505. Shields CL, Mashayekhi A, Demirci H, Meadows AT, Shields JA. Practical approach to management of retinoblastoma. Arch Ophthalmol 2004;122:729-35. Linn Murphree A. Intraocular retinoblastoma: The case for a new group classification. Ophthalmol Clin North Am 2005;18:41-53, viii. Shields CL, Shields JA. Basic understanding of current classification and management of retinoblastoma. Curr Opin Ophthalmol 2006;17:228-34. Novetsky DE, Abramson DH, Kim JW, Dunkel IJ. Published international classification of retinoblastoma (ICRB) definitions contain inconsistencies – An analysis of impact. Ophthalmic Genet 2009;30:40-4. Chantada G, Doz F, Antoneli CB, Grundy R, Clare Stannard FF, Dunkel IJ, et al. Aproposal for an international retinoblastoma staging system. Pediatr Blood Cancer 2006;47:801-5. Edge SB, Byrd DR, Compton CC, Fritz AG, Greene FL, Trotti A. AJCC Cancer Staging Manual and Handbook. 7th ed. New York: Springer; 2010. p. 623-9. Shields JA, Shields CL, editors. Diagnostic approaches to retinoblastoma. 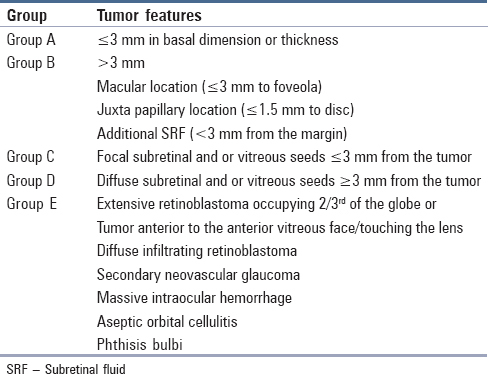 In: Intraocular Tumors: A Text and Atlas. Philadelphia: W.B. Saunders; 1992. p. 363-76. Ramasubramanian A, Shields CL, Mellen PL, Haji S, Harmon SA, Vemuganti GK, et al. Autofluorescence of treated retinoblastoma. J AAPOS 2011;15:167-72. Bianciotto C, Shields CL, Iturralde JC, Sarici A, Jabbour P, Shields JA, et al. Fluorescein angiographic findings after intra-arterial chemotherapy for retinoblastoma. Ophthalmology 2012;119:843-9. Shields CL, Mashayekhi A, Luo CK, Materin MA, Shields JA. Optical coherence tomography in children: Analysis of 44 eyes with intraocular tumors and simulating conditions. J Pediatr Ophthalmol Strabismus 2004;41:338-44. Houston SK, Berrocal AM, Murray TG. The future of diagnostic imaging in retinoblastoma. J AAPOS 2011;15:125-6. Yousef YA, Shroff M, Halliday W, Gallie BL, Héon E. Detection of optic nerve disease in retinoblastoma by use of spectral domain optical coherence tomography. J AAPOS 2012;16:481-3. Moulin AP, Gaillard MC, Balmer A, Munier FL. Ultrasound biomicroscopy evaluation of anterior extension in retinoblastoma: A clinicopathological study. Br J Ophthalmol 2012;96:337-40. Pearce MS, Salotti JA, Little MP, McHugh K, Lee C, Kim KP, et al. Radiation exposure from CT scans in childhood and subsequent risk of leukaemia and brain tumours: A retrospective cohort study. Lancet 2012;380:499-505. Shields JA, Shields CL, Meadows AT. Chemoreduction in the management of retinoblastoma. Am J Ophthalmol 2005;140:505-6. Shields CL, Shields JA. Intra-arterial chemotherapy for retinoblastoma: The beginning of a long journey. Clin Exp Ophthalmol 2010;38:638-43. Shields CL, Shields JA, Cater J, Othmane I, Singh AD, Micaily B, et al. Plaque radiotherapy for retinoblastoma: Long-term tumor control and treatment complications in 208 tumors. Ophthalmology 2001;108:2116-21. Abramson DH, Dunkel IJ, Brodie SE, Kim JW, Gobin YP. A phase I/II study of direct intraarterial (ophthalmic artery) chemotherapy with melphalan for intraocular retinoblastoma initial results. Ophthalmology 2008;115:1398-404, 1404.e1. Shields CL, Bianciotto CG, Jabbour P, Ramasubramanian A, Lally SE, Griffin GC, et al. Intra-arterial chemotherapy for retinoblastoma: Report no 1, control of retinal tumors, subretinal seeds, and vitreous seeds. Arch Ophthalmol 2011;129:1399-406. Shields CL, De Potter P, Himelstein BP, Shields JA, Meadows AT, Maris JM, et al. Chemoreduction in the initial management of intraocular retinoblastoma. Arch Ophthalmol 1996;114:1330-8. Murphree AL, Villablanca JG, Deegan WF 3rd, Sato JK, Malogolowkin M, Fisher A, et al. Chemotherapy plus local treatment in the management of intraocular retinoblastoma. Arch Ophthalmol 1996;114:1348-56. Leahey AM. Systemic chemotherapy: A pediatric oncology perspective. In: Ramasubramanian A, Shields CL, editors. Retinoblastoma. New Delhi, India: Jaypee Brothers Medical Publishers; 2012. p. 81-5. Lambert MP, Shields C, Meadows AT. A retrospective review of hearing in children with retinoblastoma treated with carboplatin-based chemotherapy. Pediatr Blood Cancer 2008;50:223-6. Leahey A. A cautionary tale: Dosing chemotherapy in infants with retinoblastoma. J Clin Oncol 2012;30:1023-4. Gombos DS, Hungerford J, Abramson DH, Kingston J, Chantada G, Dunkel IJ, et al. Secondary acute myelogenous leukemia in patients with retinoblastoma: Is chemotherapy a factor? Ophthalmology 2007;114:1378-83. Eagle RC Jr. High-risk features and tumor differentiation in retinoblastoma: A retrospective histopathologic study. Arch Pathol Lab Med 2009;133:1203-9. Gupta R, Vemuganti GK, Reddy VA, Honavar SG. Histopathologic risk factors in retinoblastoma in India. Arch Pathol Lab Med 2009;133:1210-4. Kaliki S, Shields CL, Shah SU, Eagle RC Jr., Shields JA, Leahey A, et al. Postenucleation adjuvant chemotherapy with vincristine, etoposide, and carboplatin for the treatment of high-risk retinoblastoma. Arch Ophthalmol 2011;129:1422-7. Shields CL, Meadows AT, Shields JA, Carvalho C, Smith AF. Chemoreduction for retinoblastoma may prevent intracranial neuroblastic malignancy (trilateral retinoblastoma). Arch Ophthalmol 2001;119:1269-72. Reese AB, Hyman GA, Merriam GR Jr., Forrest AW, Kligerman MM. Treatment of retinoblastoma by radiation and triethylenemelamine. AMA Arch Ophthalmol 1954;53:505-13. Yamane T, Kaneko A, Mohri M. The technique of ophthalmic arterial infusion therapy for patients with intraocular retinoblastoma. Int J Clin Oncol 2004;9:69-73. Gobin YP, Dunkel IJ, Marr BP, Brodie SE, Abramson DH. Intra-arterial chemotherapy for the management of retinoblastoma: Four-year experience. Arch Ophthalmol 2011;129:732-7. Peterson EC, Elhammady MS, Quintero-Wolfe S, Murray TG, Aziz-Sultan MA. Selective ophthalmic artery infusion of chemotherapy for advanced intraocular retinoblastoma: Initial experience with 17 tumors. J Neurosurg 2011;114:1603-8. Shields CL, Kaliki S, Shah SU, Bianciotto CG, Liu D, Jabbour P, et al. Minimal exposure (one or two cycles) of intra-arterial chemotherapy in the management of retinoblastoma. Ophthalmology 2012;119:188-92. Muen WJ, Kingston JE, Robertson F, Brew S, Sagoo MS, Reddy MA, et al. Efficacy and complications of super-selective intra-ophthalmic artery melphalan for the treatment of refractory retinoblastoma. Ophthalmology 2012;119:611-6. Shields CL, Bianciotto CG, Jabbour P, Griffin GC, Ramasubramanian A, Rosenwasser R, et al. Intra-arterial chemotherapy for retinoblastoma: Report no 2, treatment complications. Arch Ophthalmol 2011;129:1407-15. Munier FL, Beck-Popovic M, Balmer A, Gaillard MC, Bovey E, Binaghi S, et al. Occurrence of sectoral choroidal occlusive vasculopathy and retinal arteriolar embolization after superselective ophthalmic artery chemotherapy for advanced intraocular retinoblastoma. Retina 2011;31:566-73. Eagle RC Jr., Shields CL, Bianciotto C, Jabbour P, Shields JA. Histopathologic observations after intra-arterial chemotherapy for retinoblastoma. Arch Ophthalmol 2011;129:1416-21. Manjandavida FP, Shields CL. The role of intravitreal chemotherapy for retinoblastoma. Indian J Ophthalmol 2015;63:141-5. Ericson L, Karlberg B, Rosengren BH. Trials of intravitreal injections of chemotherapeutic agents in rabbits. Acta Ophthalmol (Copenh) 1964;42:721-6. Seregard S, Kock E, af Trampe E. Intravitreal chemotherapy for recurrent retinoblastoma in an only eye. Br J Ophthalmol 1995;79:194-5. Ueda M, Tanabe J, Inomata M, Kaneko A, Kimura T. Study on conservative treatment of retinoblastoma – effect of intravitreal injection of melphalan on the rabbit retina. Nippon Ganka Gakkai Zasshi 1995;99:1230-5. Shields CL, Manjandavida FP, Arepalli S, Kaliki S, Lally SE, Shields JA, et al. Intravitreal melphalan for persistent or recurrent retinoblastoma vitreous seeds: Preliminary results. JAMA Ophthalmol 2014;132:319-25. Ghassemi F, Shields CL. Intravitreal melphalan for refractory or recurrent vitreous seeding from retinoblastoma. Arch Ophthalmol 2012;130:1268-71. Rao R, Honavar SG, Sharma V, Reddy VA. Intravitreal topotecan in the management of refractory and recurrent vitreous seeds in retinoblastoma. Br J Ophthalmol 2018;102:490-5. Shields CL, Shields JA, De Potter P, Minelli S, Hernandez C, Brady LW, et al. Plaque radiotherapy in the management of retinoblastoma. Use as a primary and secondary treatment. Ophthalmology 1993;100:216-24. Choi SY, Kim MS, Yoo S, Cho C, Ji Y, Kim K, et al. Long term follow-up results of external beam radiotherapy as primary treatment for retinoblastoma. J Korean Med Sci 2010;25:546-51. Abramson DH, Frank CM. Second nonocular tumors in survivors of bilateral retinoblastoma: A possible age effect on radiation-related risk. Ophthalmology 1998;105:573-9. Gallie BL, Budning A, DeBoer G, Thiessen JJ, Koren G, Verjee Z, et al. Chemotherapy with focal therapy can cure intraocular retinoblastoma without radiotherapy. Arch Ophthalmol 1996;114:1321-8. Manjandavida FP, Honavar SG, Reddy VA, Khanna R. Management and outcome of retinoblastoma with vitreous seeds. Ophthalmology 2014;121:517-24. Shields CL, Manjandavida FP, Lally SE, Pieretti G, Arepalli SA, Caywood EH, et al. Intra-arterial chemotherapy for retinoblastoma in 70 eyes: Outcomes based on the international classification of retinoblastoma. Ophthalmology 2014;121:1453-60. Abramson DH, Daniels AB, Marr BP, Francis JH, Brodie SE, Dunkel IJ, et al. Intra-arterial chemotherapy (Ophthalmic artery chemosurgery) for group D retinoblastoma. PLoS One 2016;11:e0146582. Demirci H, Shields CL, Meadows AT, Shields JA. Long-term visual outcome following chemoreduction for retinoblastoma. Arch Ophthalmol 2005;123:1525-30. Kim JM, Kim JH, Kim SJ, Park KD, Shin HY, Ahn HS, et al. Visual prognosis of retinoblastoma in the posterior pole treated with primary chemotherapy plus local treatments. Korean J Ophthalmol 2010;24:347-52. Narang S, Mashayekhi A, Rudich D, Shields CL. Predictors of long-term visual outcome after chemoreduction for management of intraocular retinoblastoma. Clin Exp Ophthalmol 2012;40:736-42. Tsimpida M, Thompson DA, Liasis A, Smith V, Kingston JE, Sagoo MS, et al. Visual outcomes following intraophthalmic artery melphalan for patients with refractory retinoblastoma and age appropriate vision. Br J Ophthalmol 2013;97:1464-70. Honavar SG, Manjandavida FP, Reddy VA. Orbital retinoblastoma: An update. Indian J Ophthalmol 2017;65:435-42. Palma J, Sasso DF, Dufort G, Koop K, Sampor C, Diez B, et al. Successful treatment of metastatic retinoblastoma with high-dose chemotherapy and autologous stem cell rescue in South America. Bone Marrow Transplant 2012;47:522-7.